While blending modes can be used with the Brush Tool for retouching, they are also a powerful feature of the Layers Panel and can be used for simple color correction. The following steps show how to utilize blending modes to lighten an image; a color adjustment that is often necessary with digital photography. The Layers Panel has several buttons. Below is a diagram to help you navigate them. Go to the Layers Panel. 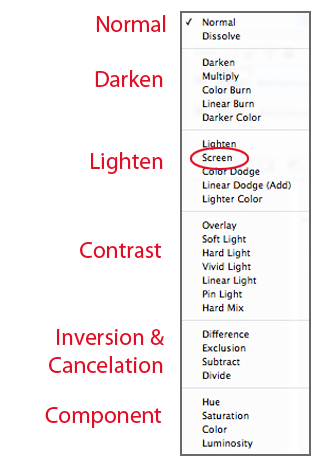 Click and hold on the Background layer and drag it to the New Layer button. This duplicates the layer. The Screen Blending Mode strengthens the highlights in an image, making it appear brighter. The brightness can now be adjusted using the layer's opacity. 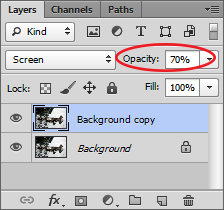 With Background copy layer selected, go to the Opacity field and set it to the desired number.